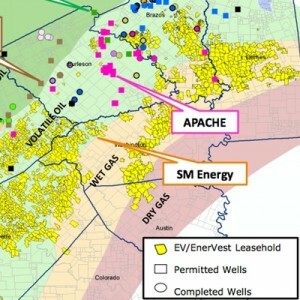 Houston-based EV Energy Partners (EVEP) and Enervest, Ltd. are selling certain deep rights in the Eagle Ford formation in Burleson, Brazos and Grimes Counties for $218-million. EVEP, a master limited partnership of which EnerVest is the controlling member of the general partner, will net $30-million from the deal. The buyer was not disclosed. EVEP officials confirmed all non-Eagle Ford formation rights, including the Austin Chalk formation and corresponding production, will be retained for both EVEP and EnerVest. The transaction is expected to close by October 15th. EVEP's remaining position in the East Texas Eagle Ford covers portions of Lee, Fayette and Washington Counties. Houser indicated in EVEP's second-quarter report that the company will retain this acreage until more drilling and production has taken place to further exploit its potential.